There may be some limited standing room only tickets available once the show starts at 8:00 pm for $31.50. 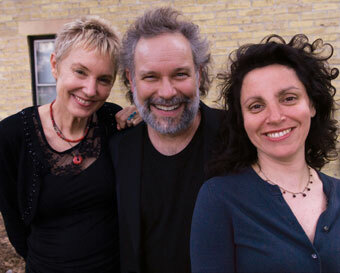 An unforgettable evening is absolutely guaranteed tonight as three of contemporary folk music's brightest lights—Eliza Gilkyson, John Gorka, and Lucy Kaplansky—join forces in a new supergroup known as Red Horse. Onstage, as on their new eponymous CD from Red House Records, this impressive trio of veteran songwriters teams up to cover each other's songs and breathe new life into old favorites. Awash in gorgeous harmonies, the blend of new and old songs mixes traditional folk and contemporary americana, originals by John, Eliza, and Lucy and interpretations of gems like Neil Young's "I Am a Child" and the traditional tune, "Wayfaring Stranger." Austin-based Eliza Gilkyson is a politically minded, superbly poetic singer-songwriter, who has become one of the most respected musicians in roots and folk circles. The Grammy-nominated artist has appeared on NPR, Austin City Limits, Mountain Stage, Air America Radio, and was inducted into the Austin Music Hall of Fame in 2003. John Gorka is a world-renowned singer-songwriter, who came out of the same Greenwich Village folk scene that produced such songwriters as Suzanne Vega and Shawn Colvin. John has recorded 11 solo CDs, and his award-winning songs have been recorded and performed by such notable artists as Mary Chapin Carpenter, Nanci Griffith, and Mary Black. Lucy Kaplansky is an acclaimed singer-songwriter, as well as a former clinical psychologist, whom the New Yorker has described as "a truly gifted performer with a bag full of enchanting songs." She was part of the group Cry Cry Cry, with Dar Williams and Richard Shindell, and she has appeared on the CBS Morning Show, NPR's Weekend and Morning Editions, and Mountain Stage. Although they have been friends for years and recorded on each other's albums, Red Horse is the first truly collaborative effort by Eliza, John, and Lucy. In Eliza's own words, "If I had to use only one word to sum up this project I would use the word ‘harmony'—not just in terms of the vocals but also in the way we relate to each other. We're friends, we love each other's work and we love to sing together."